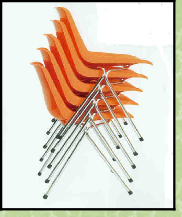 to manufacture and became a major success - changing the expectations of chair design and comfort. Public offices and private companies bought them in large numbers, not only because of their cheapness but because of the ‘stackability’ that had been incorporated into the design. London transport and the rail network uses another of Robin’s designs dating from 1995; this time using perforated steel. 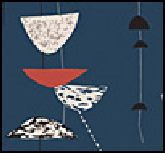 Lucienne Day’s textile designs were featured at the Festival of Britain with the example shown here (left) being one of her best known. It was titled ‘Calyx’ and was awarded an international design award from the American Institute of Decorators. Her textiles have been commissioned by a wide range of companies and used in carpet, wallpaper, ceramic and fabric/furnishing designs. In the immediate post war years there were fewer restrictions on clothing than on furnishings and interior designs and she consequently worked more in this area than any other. 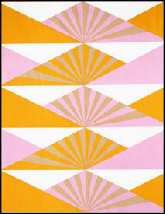 Continuing with textile designs throughout the 1950s, 60s, 70s and 80s, Lucienne produced many designs for Heal’s in London. Published in 2001 it chronicles the development of their careers. in London and have remained the most well known design couple with distinct success in their own individual special isms.